Welcome to week three of Wednesday’s With Barth! Well that was some great reading. I have condensed what I enjoyed most from my reading this week and placed it below with questions for you to interact with if you so choose. Feel free to add what you enjoyed in the comments below as well. I have also made some very simple diagrams of some of Barth’s thoughts for you below. 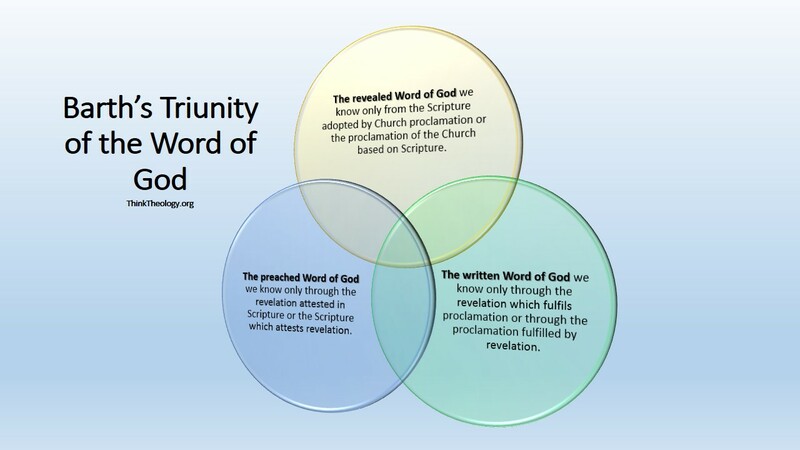 The presupposition which makes proclamation proclamation and therewith makes the Church the Church is the Word of God. This attests itself in Holy Scripture in the word of the prophets and apostles to whom it was originally and once and for all spoken by God’s revelation. 1. The Word of God is the commission upon whose givenness proclamation must rest if it is to be real proclamation. Real proclamation, then, means the Word of God preached and the Word of God preached means in this first and outermost circle man’s talk about God on the basis of God’s own direction, which fundamentally transcends all human causation, which cannot, then, be put on a human basis, but which simply takes place, and has to be acknowledged, as a fact. 2. 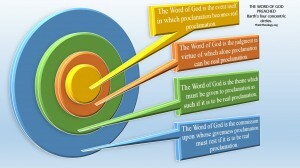 The Word of God is the theme which must be given to proclamation as such if it is to be real proclamation. Preaching and sacrament are, as we have seen, the promise of future revelation on the basis of the revelation that has already occurred. How, then, can one speak of this object except in the form of this promise, which is quite distinct from that of science, art, or politics? Real proclamation, then, means God’s Word preached, and in this second circle God’s Word preached means human talk about God on the basis of the self-objectification of God which is not just there, which cannot be predicted, which does not fit into any plan, which is real only in the freedom of His grace, and in virtue of which He wills at specific times to be the object of this talk, and is so according to His good-pleasure. 3. The Word of God is the judgment in virtue of which alone proclamation can be real proclamation. But here and now we have 1. to recollect that, even though it is not known to anyone, a different criterion from these others has given itself to be known and 2. to expect that this criterion which we do not know now, or know only from this recollection, will give itself to be known again. This criterion which is recollected and expected, though not at our disposal in our own or any present, is the Word of God. We cannot “handle” this criterion. It is the criterion which handles itself and is in no other hands. We can handle the other criteria in recollection and expectation of this criterion. But its judgment alone is absolutely binding and inviolable. Proclamation becomes real proclamation when it is endorsed by this judgment. Real proclamation, therefore, is the Word of God preached, and in this third inner circle the Word of God preached means human talk about God which by God’s own judgment, that cannot be anticipated and never passes under our control, is true with reference both to the proclaimed object and also to the proclaiming subject, so that it is talk which has to be listened to and which rightly demands obedience. 4. Finally—and only here do we make the decisive point—the Word of God is the event itself in which proclamation becomes real proclamation. It is the miracle of revelation and faith when the misunderstanding does not constantly recur, when proclamation is for us not just human willing and doing characterised in some way but also and primarily and decisively God’s own act, when human talk about God is for us not just that, but also and primarily and decisively God’s own speech. It is this miracle that in the fourth and innermost circle of our deliberations we have not so much to explain as rather to evaluate as this specific miracle. “Not only—but also and primarily and decisively” is how the formula must run. The “not only—but also” means first that human talk, with its motives and themes and the judgments among which it stands as human talk, is there even while God’s Word is there. The miracle of real proclamation does not consist in the fact that the willing and doing of proclaiming man with all its conditioning and in all its problems is set aside, that in some way a disappearance takes place and a gap arises in the reality of nature, and that in some way there steps into this gap naked divine reality scarcely concealed by a mere remaining appearance of human reality. Question: What do you think about the Word of God (Person and work of Jesus) as an “event”? Question: How does it change our current Evangelical thinking to think of Jesus as an “event” that can happen and be experienced in real proclamation? Question: How does “Biblioidolatry” or in what ways can “Biblicism” snuff out the Word of God event? We have said that Church proclamation must be ventured in recollection of past revelation and in expectation of coming revelation. The basis of expectation is obviously identical here with the object of recollection. Hoping for what we cannot see, what we cannot assume to be present, we speak of an actualised proclamation, of a Word of God preached in the Church, on the basis that God’s Word has already been spoken, that revelation has already taken place. We speak in recollection. Question: How does this pour into pulpit ministry during the Advent season? All that remains now is to add a final word. Presupposing that we are right about the fact described, that by Holy Scripture the Church is summoned and directed to its proclamation and empowered for it, this implies that Holy Scripture, too, is the Word of God. It is so in exactly the same sense in which we have said this of the event of real proclamation. Recollection of God’s past revelation, discovery of the Canon, faith in the promise of the prophetic and apostolic word, or better, the self-imposing of the Bible in virtue of its content, and therefore the existence of real apostolic succession, is also an event, and is to be understood only as an event. In this event the Bible is God’s Word. 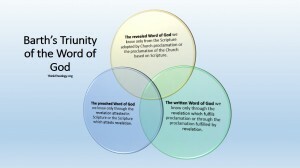 That is to say, in this event the human prophetic and apostolic word is a representative of God’s Word in the same way as the word of the modern preacher is to be in the event of real proclamation : a human word which has God’s commission to us behind it, a human word to which God has given Himself as object, a human word which is recognised and accepted by God as good, a human word in which God’s own address to us is an event. The fact that God’s own address becomes an event in the human word of the Bible is, however, God’s affair and not ours. This is what we mean when we call the Bible God’s Word. We confess and acknowledge therewith that the recollection of God’s past revelation, without which the enterprise of Church proclamation would be impossible, is just as much God’s grace and gift as is the actualisation our own proclamation needs. It is not in our own power to make this recollection, not even in the form of our grasping at the Bible. Only when and as the Bible grasps at us, when we are thus reminded, is this recollection achieved. If this takes place, if the Bible speaks to us thus of the promise, if the prophets and apostles tell us what they have to tell us, if their word imposes itself on us and if the Church in its confrontation with the Bible thus becomes again and again what it is, all this is God’s decision and not ours, all this is grace and not our work. The Bible is God’s Word to the extent that God causes it to be His Word, to the extent that He speaks through it. 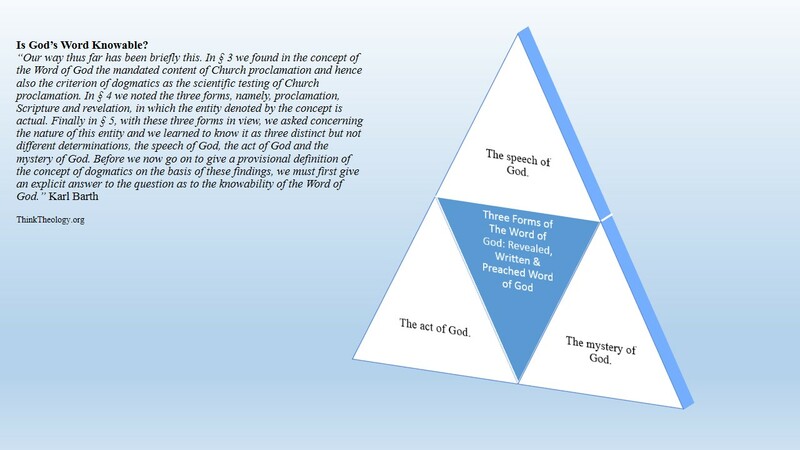 In this second equation no less than the first (namely, that Church proclamation is God’s Word) we cannot abstract from the free action of God in and by which He causes it to be true to us and for us here and now that the biblical word of man is His own Word. The statement that the Bible is God’s Word is a confession of faith, a statement of the faith which hears God Himself speak through the biblical word of man. To be sure it is a statement which, when venturing it in faith, we accept as true even apart from our faith and beyond all our faith and even in face of our lack of faith. We do not accept it as a description of our experience of the Bible. We accept it as a description of God’s action in the Bible, whatever may be the experiences we have or do not have in this connexion. But this is precisely the faith which in this way sees and reaches beyond itself and all related or unrelated experiences to God’s action, namely, to the fact that God’s action on man has become an event, and not therefore that man has grasped at the Bible but that the Bible has grasped at man. The Bible, then, becomes God’s Word in this event, and in the statement that the Bible is God’s Word the little word “is” refers to its being in this becoming. It does not become God’s Word because we accord it faith but in the fact that it becomes revelation to us. But the fact that it becomes revelation to us beyond all our faith, that it is God’s Word even in spite of our lack of faith, is something we can accept and confess as true to us and for us only in faith, in faith as opposed to unbelief, in the faith in which we look away from our faith and unbelief to the act of God, but in faith and not in unbelief, and therefore precisely not in abstraction from the act of God in virtue of which the Bible must become again and again His Word to us. 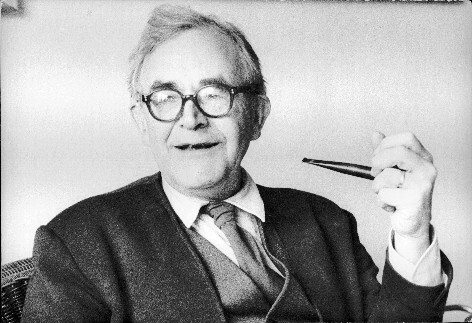 Question: Barth said… “It is not in our own power to make this recollection, not even in the form of our grasping at the Bible. Only when and as the Bible grasps at us, when we are thus reminded, is this recollection achieved.” How much of fundamentalism within Evangelicalism has replaced being grasped by the Bible with grasping the Bible? The Bible is the concrete means by which the Church recollects God’s past revelation, is called to expectation of His future revelation, and is thus summoned and guided to proclamation and empowered for it. The Bible, then, is not in itself and as such God’s past revelation, just as Church proclamation is not in itself and as such the expected future revelation. The Bible, speaking to us and heard by us as God’s Word, bears witness to past revelation. Proclamation, speaking to us and heard by us as God’s Word, promises future revelation. The Bible is God’s Word as it really bears witness to revelation, and proclamation is God’s Word as it really promises revelation. Why and in what respect does the biblical witness have authority? Because and in the fact that he claims no authority for himself, that his witness amounts to letting that other itself be its own authority. We thus do the Bible poor and unwelcome honour if we equate it directly with this other, with revelation itself. This may happen when we seek and think we find revelation in the heroic religious personality of the biblical witness. But it may also happen in the form of a general, uniform and permanent inspiredness of the Bible, which we shall have to speak about later. In the work already mentioned (Der Begriff des Auserwählten, ed. T. Haecker, 1917, p. 314), Kierkegaard very rightly says that mistaking an apostle for a genius is to be seen not only on the side of heterodoxy but also on that of hyperorthodoxy, and on that of thoughtlessness in general. We should not in fact forget that the historical view of the Bible with its cult of heroes and the doctrine of mechanical inspiration are both products of the same age and spirit. A common feature is that they both represent means whereby Renaissance man tried to control the Bible and also tried to set up obstacles to stop it controlling him, as indeed it ought to do. The direct identification between revelation and the Bible which is in fact at issue is not one that we can presuppose or anticipate. It takes place as an event when and where the biblical word becomes God’s Word, i.e., when and where the biblical word comes into play as a word of witness, when and where John’s finger does not point in vain but really indicates, when and where we are enabled by means of his word to see and hear what he saw and heard. Thus in the event of God’s Word revelation and the Bible are indeed one, and literally so. “For this preaching means: ‘Fear not, for unto you is born this day the Saviour, which is Christ the Lord.’ Men’s words which have grown up in the hearts of men are not like that. For the wisest folk on earth know naught thereof. But this preaching rang down from heaven, of which same, God be praised for ever, we are become partakers. For’tis all the same if thou hearest or readest this preaching as if thou hadst heard it from the angel himself. For the shepherds too saw not the angels, they saw but the light and the glory. But the words of the angels they heard, which we still hear in preaching, may still be read in the Book, if we will but open our eyes and our ears and learn and use aright such preaching” (Luther, Predigt von der Engel Lobgesang, 1544, W.A., 52, P. 50. l. 13). This fulfilled time which is identical with Jesus Christ, this absolute event in relation to which every other event is not yet event or has ceased to be so, this “It is finished,” this Deus dixit*(God Said) for which there are no analogies, is the revelation attested in the Bible. To understand the Bible from beginning to end, from verse to verse, is to understand how everything in it relates to this as its invisible-visible centre. 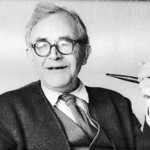 Question: What do you think of Barth’s claim that Revelation is the centre of the Bible? All revelation, then, must be thought of as revealing, i.e., as conditioned by the act of revelation. The event in which revelation occurs must be seen in connexion with what has happened once and for all in this act. All fulfilled time must be seen as filled with the fulness of this time. Revelation itself, however, is not referred to anything other, higher, or earlier. Revelation as such is not relative. Revelation in fact does not differ from the person of Jesus Christ nor from the reconciliation accomplished in Him. To say revelation is to say “The Word became flesh.” To be sure, one can say something quite different by revelation, something purely formal, and relative as such. But to say this is not to say what the Bible means by the word or what Church proclamation is referring to when it refers to the Bible or what must be called revelation in Christian dogmatics if this is to take itself seriously as such. When in the word revelation we say “The Word was made flesh and dwelt among us,” then we are saying something which can have only an intertrinitarian basis in the will of the Father and the sending of the Son and the Holy Spirit, in the eternal decree of the triune God, so that it can be established only as knowledge of God from God, of light in light. The same applies if instead of Jesus Christ we say concretely “God with us.” It is true that in the term revelation we might have something relative rather than this absolute in view, but the Bible is thinking only of this absolute, and in the knowledge of this absolute the Church with the help of the Bible recalls past revelation, and a dogmatics that works in the sphere of the Church and not in a vacuum has also to cling to it. But to say “God with us” is to say something which has no basis or possibility outside itself, which can in no sense be explained in terms of man and man’s situation, but only as knowledge of God from God, as free and unmerited grace. As the Bible bears witness to God’s revelation and as Church proclamation takes up this witness in obedience, both renounce any foundation apart from that which God has given once and for all by speaking. The Bible and proclamation both appeal to this fact that has been given here and now. They cannot reproduce it as a given fact. They cannot bring it on the scene themselves. They can only attest and proclaim it. To bring it about that the Deus dixit* is present with the Church in its various times and situations is not in the power of the Bible or proclamation. The Deus dixit* is true—now the ubi et quando*(Where and When) must come into force again—where it is true, i.e., where and when God, in speaking once and for all, wills according to His eternal counsel that it be true, where and when God by His activating, ratifying and fulfilling of the word of the Bible and preaching lets it become true. This being and becoming true of revelation consists, then, in the fact that the Church really recollects past revelation, and in faith receives, grasps and really proclaims the biblical witness of it as the real promise of future revelation, future revelation here being simply that which has taken place once and for all but it now directed to us too, just as the Christ who comes again is no other than the Christ who has come, but this Christ as the One who now comes also to us. The “God with us” becomes actual for us hic et nunc* as the promise received and grasped in faith because it is illic et tunc* a divine act. It is thus that which is true in and for itself, and it becomes true for us as recollection and also as promise, as recollection of Christ come in the flesh and as hope of Christ coming again in glory. It is Jesus Christ Himself who here speaks for Himself and needs no witness apart from His Holy Spirit and the faith that rejoices in His promise received and grasped. This independent and unsurpassable origin of the Word of God that comes to us is what we have in view when we speak of its third form, or materially we should rather say its first form, i.e., its form as the Word of God revealed. We have been speaking of three different forms of the Word of God and not of three different Words of God. In this threefold form and not otherwise—but also as the one Word only in this threefold form—the Word of God is given to us and we must try to understand it conceptually. It is one and the same whether we understand it as revelation, Bible, or proclamation. There is no distinction of degree or value between the three forms. For to the extent that proclamation really rests on recollection of the revelation attested in the Bible and is thus obedient repetition of the biblical witness, it is no less the Word of God than the Bible. And to the extent that the Bible really attests revelation it is no less the Word of God than revelation itself. As the Bible and proclamation become God’s Word in virtue of the actuality of revelation they are God’s Word: the one Word of God within which there can be neither a more nor a less. Nor should we ever try to understand the three forms of God’s Word in isolation. The first, revelation, is the form that underlies the other two. But it is the very one that never meets us anywhere in abstract form. We know it only indirectly, from Scripture and proclamation. The direct Word of God meets us only in this twofold mediacy. But Scripture too, to become God’s Word for us, must be proclaimed in the Church. So, to give a survey of the whole, the following brief schedule of mutual relations may be drawn up. The revealed Word of God we know only from the Scripture adopted by Church proclamation or the proclamation of the Church based on Scripture. The written Word of God we know only through the revelation which fulfils proclamation or through the proclamation fulfilled by revelation. The preached Word of God we know only through the revelation attested in Scripture or the Scripture which attests revelation. There is only one analogy to this doctrine of the Word of God. Or, more accurately, the doctrine of the Word of God is itself the only analogy to the doctrine which will be our fundamental concern as we develop the concept of revelation. 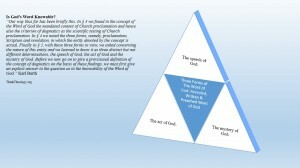 This is the doctrine of the triunity of God. In the fact that we can substitute for revelation, Scripture and proclamation the names of the divine persons Father, Son and Holy Spirit and vice versa, that in the one case as in the other we shall encounter the same basic determinations and mutual relationships, and that the decisive difficulty and also the decisive clarity is the same in both—in all this one may see specific support for the inner necessity and correctness of our present exposition of the Word of God. The Word of God in all its three forms is God’s speech to man. For this reason it occurs, applies and works in God’s act on man. But as such it occurs in God’s way which differs from all other occurrence, i.e., in the mystery of God. Church proclamation is talk, speech. So is Holy Scripture. So is even revelation in itself and as such. If we stay with God’s Word in the three forms in which it is actually heard in the Church, if we do not go outside the Church and think of things God might have willed and done but has not done and so not willed in the Church, we have no reason not to take the concept of God’s Word primarily in its literal sense. God’s Word means that God speaks. Speaking is not a “symbol” (as P. Tillich, Rel. Verwirkl., 1930, p. 48 thinks). It is not a designation and description which on the basis of his own assessment of its symbolic force man has chosen for something very different from and quite alien to this expression. (1) First, the Word of God as directed to us is a Word which we do not say to ourselves and which we could not in any circumstances say to ourselves…. (2) Secondly, the Word of God as this Word of the Lord directed to us is the Word which aims at us and smites us in our existence…(3) Thirdly, the Word of God as the Word of the Creator directed to us is the Word which has obviously become necessary and is necessary as a renewal of the original relation between us and Him… (4) Fourthly and finally the Word of God as the Word of reconciliation directed to us is the Word by which God announces Himself to man, i.e., by which He promises Himself as the content of man’s future, as the One who meets him on his way through time as the end of all time, as the hidden Lord of all times. Our way thus far has been briefly this. In § 3 we found in the concept of the Word of God the mandated content of Church proclamation and hence also the criterion of dogmatics as the scientific testing of Church proclamation. In § 4 we noted the three forms, namely, proclamation, Scripture and revelation, in which the entity denoted by the concept is actual. Finally in § 5, with these three forms in view, we asked concerning the nature of this entity and we learned to know it as three distinct but not different determinations, the speech of God, the act of God and the mystery of God. Before we now go on to give a provisional definition of the concept of dogmatics on the basis of these findings, we must first give an explicit answer to the question as to the knowability of the Word of God. By the knowledge of an object by men we understand confirmation of their acquaintance with its reality in respect of its existence and its nature. But confirmation of their acquaintance means that the reality of the object concerned, its existence and nature, being true in themselves, now become in some way, and with some degree of clarity and distinctness, true for men too. Their acquaintance with it, instead of being a contingent and outward determination of their own existence, now becomes a necessary and inward determination. Knowing, they are affected by the object known. They no longer exist without it, but with it. In so far as they think of it, with the same confidence with which they dare to think in general they must think of it as a true reality, as true in its existence and nature. Whatever else and however else they may think of it, they must begin by thinking of the truth of its reality. Face to face with this truth they can no longer withdraw into themselves in order to affirm, question or deny it thence. Its truth has come home to them, has become their own. And in the process they themselves have become the truth’s. This event, this confirmation, in contrast to mere cognizance, we call knowledge. Cognizance becomes knowledge when man becomes a responsible witness to its content. A few preliminary observations on this way of putting it will lead on directly to the matter itself. We do not say: How do men know the Word of God? This would mean asking about the reality of this knowledge. But after all that we have heard about its forms and nature, the reality of the knowledge of God can be the content of an answer that man must give to this question only in so far as this answer consists in the repetition of the biblical promise given to the Church and the reference to its coming fulfilment, and only in so far as the Word of God itself is added to this human repetition and reference and undertakes to give the real answer. In other words man’s only answer to the question as put in this way is proclamation. But in order to be clear that this is so, our question must be: How can men know the Word of God? We must ask about the possibility of this event. The very significance of the insight that the Word of God alone answers the question of real knowledge of the Word of God demands that we consider whether it can only be thus or whether it might be otherwise. We do not say: How can all men know the Word of God? or even: How can any man know the Word of God? We have already recalled that it is not an issue of men universally or of man in general but very concretely and specifically of man in the Church. Where the Word of God is known and therefore can be known, it must have been spoken and it must have come as a divine call to specific men. God knows them, these men, who on specific occasions know God’s Word as real hearers and proclaimers, who are thus able to know it, and who thereby constitute the Church as living human members in the body of Christ. Our concern is with the possibility of knowledge of these men. Just because God knows them, we prefer not to say: How do Christians know the Word of God? We might put it thus, but we should have to add: called and elect Christians, and this would be obscure, for the real issue is how men by knowing God’s Word can become called and elect and therefore real Christians, hearers and proclaimers of the Word of God. God knows those who become this. But we know even Christians only as men who as such put to us the question how it is possible that they should know the Word of God. When we ask about the possibility of knowledge of the Word of God, we are presupposing that the concept of knowledge is known. But as above we shall deliberately have to take it so generally, with such philosophical and epistemological imprecision, that the possibility is left open of correction, restriction or reversal in the light of the object concerned. When knowledge was defined earlier as acquaintance with the reality of an object which is self-confirmed in the subject, this was meant to be only a sketch of the problem of knowledge and not an anticipatory interpretation. Any interpretation at this stage would mean philosophical and epistemological definition. But the problem of knowledge cannot be presupposed with such distinctness here even as a problem if we are not to incur the most serious risk of anticipating the answer in the presupposition in a very definite and perhaps most inappropriate way. What knowledge means as knowledge of God must in no case be introduced in a definitive form into investigation of this question. To be sure, it is not these formulae which describe the real content of the Word of God, but the content of the Word which God Himself speaks and which He does so always as these formulae indicate, the real content of the real Word of God, that tells man also that there can be no question of any ability to hear or understand or know on his part, of any capability that he the creature, the sinner, the one who waits, has to bring to this Word, but that the possibility of knowledge corresponding to the real Word of God has come to him, that it represents an inconceivable novum (new thing)* compared to all his ability and capability, and that it is to be understood as a pure fact, in exactly the same way as the real Word of God itself. In the word acknowledgment, as we have already said, there lies the relation to a control, a necessity. We have to remember that the Word of God has power, power as word has power, the power of God’s truth, the power of His promise, claim, judgment and blessing which are its content, but power. Acknowledgment of the Word of God by man is naturally, then, approval of the Word of God by man, yet not approval on the basis of persuasion between equals, but the kind of approval that arises on the basis of obedience, of submission between those who are utterly unequal. To have experience of God’s Word is to yield to its supremacy. Whether it comes to us as Law or Gospel, as command or promise, it comes at any rate in such a way as to bend man, and indeed his conscience and will no less than his intellect and feeling. It does not break him; it really bends him, brings him into conformity with itself. Just because acknowledgment of the mystery of God in His Word is at issue, we must also stress the fact that the term acknowledgment denotes an act or movement on man’s part, a movement which only as it is made is the acknowledgment required, so that it cannot be resolved into an attitude. What prevents the latter in experience of God’s Word, and what makes this experience, where it is real, into a movement, is what we called in § 5 the one-sideness of the Word of God. We meant by this the fact that the total Word of God, whether veiled and unveiled, or unveiled and veiled, always encounters us, and that this is each time something specific for us, that it is one-sided for us, that now it encounters us in its veiling and now in its unveiling, that it is not manifest to us in the unity of the two, and yet that it always seeks to be heard by us as a complete Word of God. In view of this, acknowledgment of the Word of God necessarily means letting oneself be continually led, always making a step, always being in movement from the experience felt at one time or the thought grasped at one time to the opposite experience and thought, because hearing of God’s Word always consists in also hearing the one in the other and the other in the one. In this movement which cannot be arrested by any synthesis a man acknowledges the mystery of the Word of God and he has Christian experience. At the beginning of this section we said that we could investigate only the knowability and not the knowledge of God’s Word, because the knowledge of God’s Word is no other than the reality of the grace of God coming to man, whose How as a reality is as hidden from us as God Himself is, so that we can only relate ourselves to it with our questions and answers. God has revealed it and will always reveal it, and man may proclaim it. We cannot ask how that happens but only, assuming that it does, how it can happen, how we are to understand it that men become the subject or object of this event. Now this very question has led us back again, and for the first time in full truth, to the event itself. We have found that the possibility of the knowledge of God is absolutely grounded, implied and included in the event of its actualisation, and our Yes to this possibility is one long reference to this event. We cannot produce this event and so we cannot give a basis for our reference; we could do so only by producing the event to which it points and letting it speak for itself. Hence we can only ask—and we certainly must ask—what the reference means in this context, how far, in what sense, with what special necessity we refer to that event as the place where the question of the knowability of the Word of God is decided. To the question so put the answer is that we refer to this event as the event of faith. Faith—we could no longer avoid the term at the end of our deliberations on experience in the third sub-section—is the making possible of knowledge of God’s Word that takes place in actual knowledge of it. The event concerned can and must be understood under many other concepts. Following the general tradition of the Church and theology, we choose this particular term here because it does in fact denote both precisely and yet also comprehensively the element in this event which constitutes it the making possible of knowledge of the Word of God. If one asks about the reality of the knowledge of God, which is so inconceivable in its How, which can be revealed only by God, which can be proclaimed by man only in the service of God and in virtue of His presence; if one asks what this reality is in so far as the knowability of God is included within it, the only possible answer which is both accurate and exhaustive is that this reality is faith. Thus it is in faith, as the possibility given in faith, that we have to understand the knowability of the Word of God. In the event of faith it is as it were born, it comes into view, and it is to be sought and found. Of the event of faith according to the understanding of the New Testament peculiar to the Evangelical Church, three things at least must be said as important in the present context, and these will yield three different definitions of the concept of the knowability of the Word of God. 1. In faith as real experience the acknowledgment of God’s Word which we have understood to be the concrete form of its experience by man is as it were put into effect by the Word of God known. 2. If what happens in faith is that acknowledgment of God’s Word, as it can become a human act and experience, is, as it were, brought into force not by itself but by the Word of God acknowledged, so that it is real acknowledgment, we must now make the positive statement that in faith men have real experience of the Word of God, and no finitum non capax infiniti(Finite cannot contain the infinite)*, no peccator non capax verbi divini(Sinner cannot receive the divine word)*, can now prevent us from taking this statement seriously with all that it involves. The Word of God becomes knowable by making itself known. The application of what has been said to the problem of knowledge consists in stopping at this statement and not going a single step beyond it. The possibility of knowing the Word of God is God’s miracle on us just as much as is the Word itself or its being spoken. Question: What did you read in this post or in your readings that struck you? Why? *Post and Discussion Day on the blog.